Daniel Henshawe1,4 [Daniel Henshaw5, Daniel Hanshaw6]. Joshua Henshaw's pedigree (prepared in 1701) conflicts on Daniel's date of birth: "aet 55 ann." 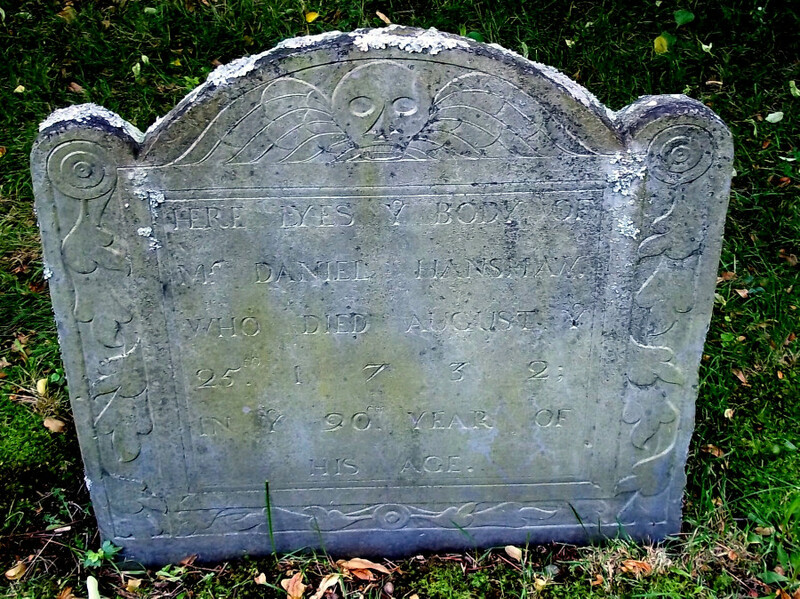 (making his birth about 1646) "- and about 7 years @ 1651" (making his birth about 1644).1 The "Hinshaw and Henshaw Families" lists his date of birth as 1644.5 His gravestone shows, when he died in 1732, it was in6 Ye 90[th] YEAR OF HIS AGE (making his birth about 1642). Daniel was deported to New England with his brother Joshua in 1653.1 (The Hinshaw/Henshaw book lists the date of deportation as 1654).5 See: The Story of Joshua and Daniel. Mary Pond, born Jul 14 1657. Martha Pond, born Apr 13 1660. (possibly also) Sarah, married Desire Clap. HENSHAW, HINSHAW, or HINSHEW, DANIEL, Milton. He was sent to our country with his brother in their youth, says a doubtful tradition, was first of Dorchester, married Mary, widow of Nicholas Allen, who had been widow of Robert Pond, had Daniel, who died unmarried His wife died 19 November 1719, in 83d year. James Savage, Boston: Genealogical Publishing Company, 1860-1862. James Savage, Genealogical Publishing Company, 1965; http://www.ancestry.com.